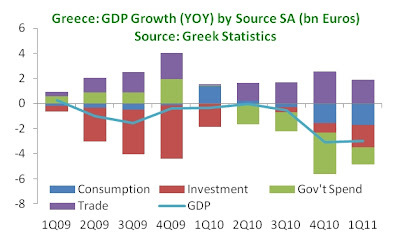 Greece’s economy continues to contract at an alarming rate: the Greek Statistical Agency released its flash estimate for GDP growth in Q2 2011, putting it at -6.9% (not seasonally adjusted). Evangelos Venizelos, the finance minister, admitted that GDP this year may fall by over 4.5%, the fourth revision against an initially estimated -3% and higher than the -3.8% assumed in the government’s medium-term strategy. 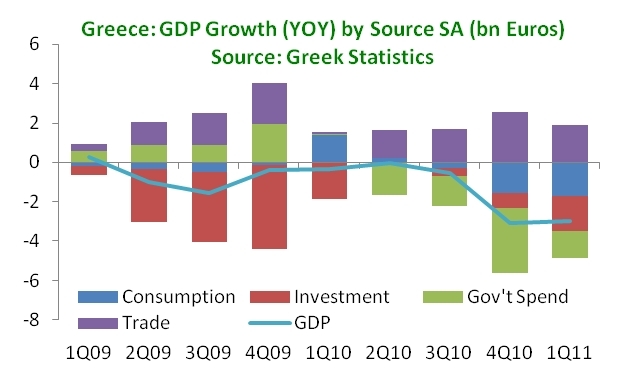 These numbers will test Greece both internally and externally: internally because better days will take longer to come and externally because Greece will likely miss its fiscal targets. The GDP decline of 6.9% in Q2 marks a slight improvement relative to the 8.8% decline in Q4 2010 and the 8.1% drop in Q1 2011 – but this “improvement” is merely a statistical artifact and reflects the extreme weakness in the comparison quarter (Q2 2010). It is only because it is compared to such a low point, that the decline in Q2 looks “better” than before. 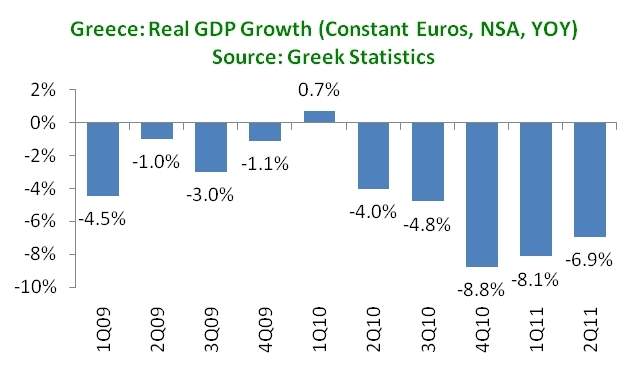 The decline underscores the negative trajectory of the Greek economy: only in one quarter since 2009 has GDP grown, and then only on a non-seasonally adjusted basis. On a seasonally adjusted basis, there has been no growth since Q4 2008. In fact, when looking at performance by quarter, Q1 and Q2 2011 are just 1% above Q1 and Q2 2004, meaning that real GDP is effectively where it was in 2004 (although data revisions means the numbers are not 100% comparable). What is more, the composition of the GDP drop has changed. In 2009, the GDP contraction was driven chiefly by investment, while government spending and trade contributed positively to GDP. In 2010, the decline was at first driven by investment and later by government spending; it was only in Q4 2010 that there was a significant fall in consumption. Investment, meanwhile, continued to drop but at a much smaller rate. 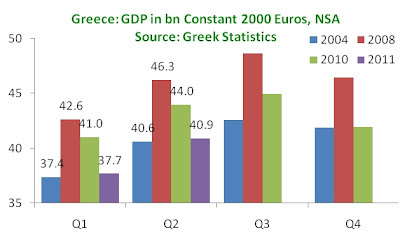 By Q1 2011, however, the decline was more evenly spread, highlighting that no sector has been spared by the recession. The only positive for GDP has been trade where a shrinking current account deficit has boosted GDP. But even there, only half of the gain has been due to rising exports, with the other half coming from lower imports. What are the implications of this dynamic? 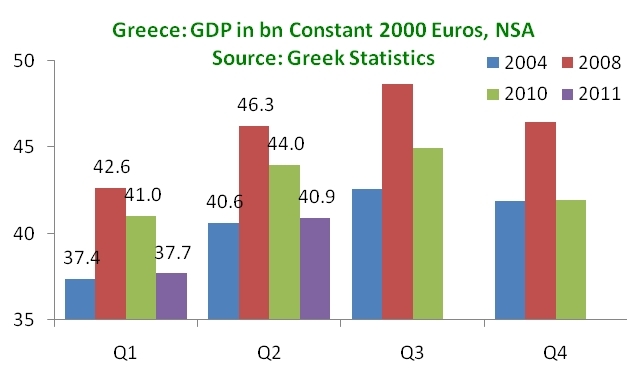 First, Greece’s GDP is unlikely to recover to 2008 levels until late in the decade, unless the post-crisis growth turns much better than expected. Second, it means that the period of patience – the period before growth eases political strain – is pushed out further, perhaps into late 2012 or 2013. 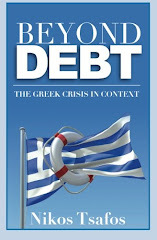 And third, Europe’s tolerance for Greece will be tested if Greece starts to miss its targets more severely.